Is the following infographic's comparison of Iran and the USA accurate? 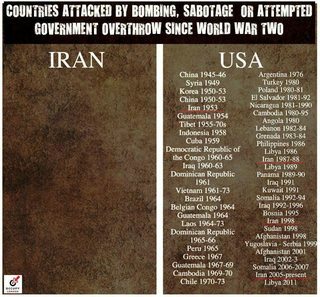 I'm not skeptical of the claim that the USA has attacked a lot of countries, but I am skeptical of the claim that, based on the criteria used for including countries on the "USA" list, that no countries would be included in the "Iran" list. China 1945-46, Syria 1949, Korea 1950-53, China 1950-53, Iran 1953, Guatemala 1954, Tibet 1955-70s, Indonesia 1958, Cuba 1959, Democratic Republic of the Congo 1960-65, Iraq 1960-63, Dominican Republic 1961, Vietnam 1961-73, Brazil 1964, Belgian Congo 1964, Guatemala 1964, Laos 1964-73, Dominican Republic 1965-66, Peru 1965, Greece 1967, Guatemala 1967-69, Cambodia 1969-70, Chile 1970-73, Argentina 1976, Turkey 1980, Poland 1980-81, El Salvador 1981-92, Nicaragua 1981-1990, Cambodia 1980-95, Angola 1980, Lebanon 1982-84, Grenada 1983-84, Philippines 1986, Libya 1986, Iran 1987-88, Libya 1989, Panama 1989-90, Iraq 1991, Kuwait 1991, Somalia 1992-94, Iraq 1992-1996, Bosnia 1995, Iran 1998, Sudan 1998, Afghanistan 1998, Yugoslavia Serbia 1999, Afghanistan 2001, Iraq 2002-2003, Somalia 2006-2007, Iran 2005-present, Libya 2011. This answer predated the Yemeni Civil war, so let's prepend the fact that for several years now, Iran-backed Houthis rebels not only waged the civil war in Yemen, but also attacked Saudi Arabia (including by missiles supplied by Iran specifically for the purpose). 1983 and on - Lebanon. Up to and including assassinating a Prime Minister. 1996 and many others - Saudi Arabia, including in-country (1996 Khobar tower bombing (src)) and diplomats' assassinations elsewhere. 2012 - Bulgaria - Terrorist attack on Israeli tourists. Bahrain - See timeline in this Stratfor article quoted here, as far back as 1981 Iranian-backed coup. Afghanistan - support for Taliban (src, src). Kuwait wasn't "attacked by USA". It was liberated from being occupied by Iraq! Neither was Somalia - it was a UN military operation where US acted under Resolution 794 to support humanitarian relief. Not the answer you're looking for? Browse other questions tagged united-states politics iran .